International Meeting on Atomic and Molecular Physics and Chemistry, Madrid (2010). 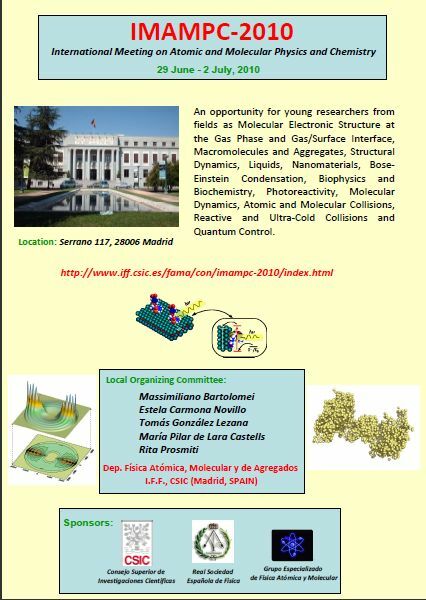 The "International Meeting on Atomic and Molecular Physics and Chemistry - IMAMPC 2010" was intended to be the starting point of a Conference Series aimed to bring together young scientists around the World. This pioneering forum of discussion was focussed on postdoctoral fellows and young researchers with an already demonstrated degree of expertise in the fields of Atomic and Molecular Physics and Chemistry. By highlighting state-of-the-art advances and their application within these fields, the scope of the Conference was to facilitate the exchange of ideas as well as to promote and strengthen collaborations. The meeting was intended to have an interdisciplinary nature, expecting to bring together theoreticians and experimentalists from fields as diverse as Molecular Electronic Structure at the Gas Phase and Gas/Surface Interface, Macromolecules and Aggregates, Structural Dynamics, Liquids, Nanomaterials, Bose-Einstein Condensation, Biophysics and Biochemistry, Photoreactivity, Molecular Dynamics, Atomic and Molecular Collisions, Reactive and Ultra-Cold Collisions, or Quantum Control. Massimiliano Bartolomei; Estela Carmona Novillo; Tomás González-Lezana; María Pilar de Lara-Castells; Rita Prosmiti.